New England Bites: Gourmet & Gourmand, Inc.
Hello fans! Laura here. It’s been quite a while since our last review, but we’ve been visiting a lot of our old favorites lately. 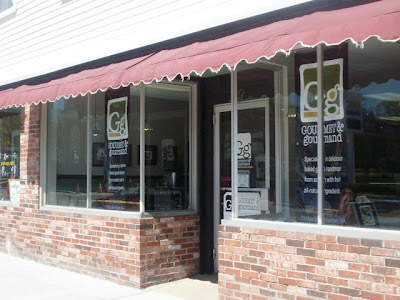 Now that we’ve finally decided to “get back out there”, we took a trip to Wareham to visit Gourmet & Gourmand, Inc. – a bakery and café that we read about on Facebook (thanks Zeke). We arrived at 2 p.m., but with road construction blocking almost every parking space, we had a bit of trouble getting there. Once inside, we were greeted by a friendly girl who chatted with Mom about the slow business they’ve been experiencing since the construction started. Fingers crossed that it doesn’t go on much longer because everyone needs to stop in and see the fantastic offerings that Gourmet & Gourmand has available. Surrounding the small dining area were several displays that held their packaged food products like stuffing mix, biscotti, artisan breads, and dog cookies. In the refrigerated case was a variety of pastries, parfaits, tarts, cakes, and delicious foods to take home like cranberry walnut chicken salad and quiche. Although we didn’t eat at the café, they serve several creative salads, sandwiches, bruschettas, cheese plates, and soups. 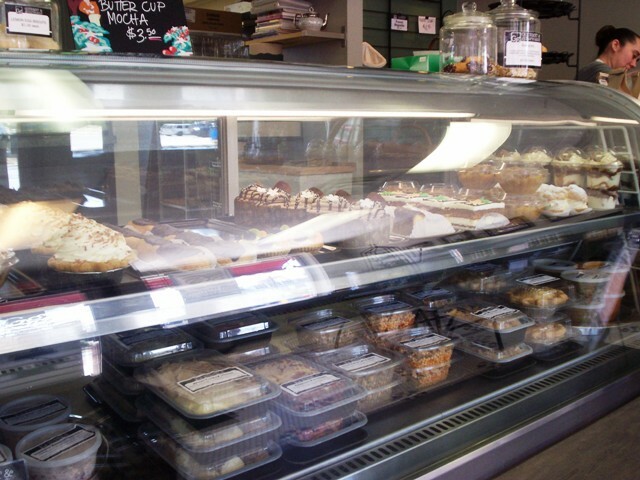 You can also get vegetarian and lactose free meals and everything is priced under $10. Please click the above link to view their full café menu. You can also order custom cakes and pies. 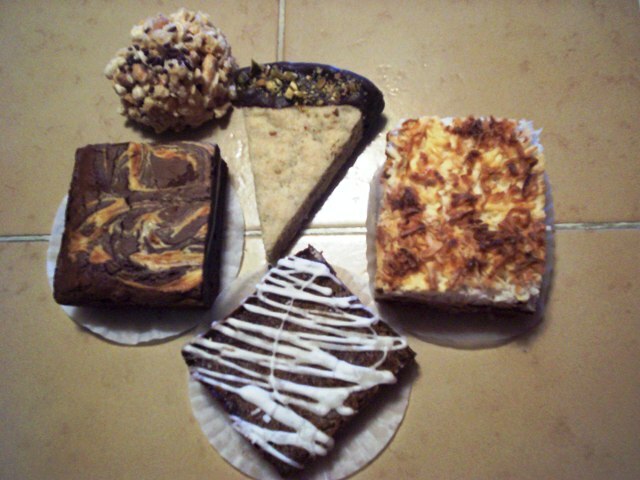 Now that Mom and I figured out that we were more gourmands (those who love to eat) than gourmets (those who like exceptional food), we decided to load up on their sweeter selections and save their savory foods for another time. Mom decided on five things: a lemon espresso bar ($2.50), chocolate fudge brownie ($2.50), pistachio cardamom shortbread ($2), magic bar ($2.50), and a barnacle ($2), which is a mix of several different snack foods formed into a crunchy ball. The total came to a little over $12 with tax. After Mom paid, I spotted a sign for peanut butter iced coffee. I really hope that I’m able to get that on my next visit. I’ve been thinking about it ever since! The next day, Mom and I did a taste test of all of the goodies. Each one was better than the next. These pastries were absolutely fantastic. They were so flavorful and tasted exactly as we expected. If you closed your eyes, you could recognize the flavors in each one without looking at it. The barnacle was a tasty surprise because it was a salty/sweet mix with a crispy texture that was completely addictive. It reminded us of Cracker Jacks and Rice Krispie Treats. 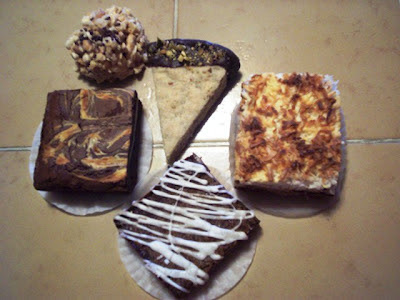 The brownie was fudgy and looked to have a cream cheese swirl. The lemon espresso bar was a great breakfast treat because the espresso flavor really woke us up! The magic bar was … well … HUGE! I’ve made magic bars before (coconut, chocolate, nuts, butterscotch chips, etc. ), but this was insane. It was incredibly tasty and neat to eat – considering all of the toppings. Finally, the shortbread was crunchy and had that lovely spiciness from the cardamom. Everything was delightfully delectable and very well made. Gourmet & Gourmand is a hidden gem, and even with the road construction, you should make your way to Wareham and stop in for some lunch and a sweet. The shop definitely lives up to its gourmet title, but gourmets and gourmands alike will enjoy eating here because of its fine foods and affordable prices. 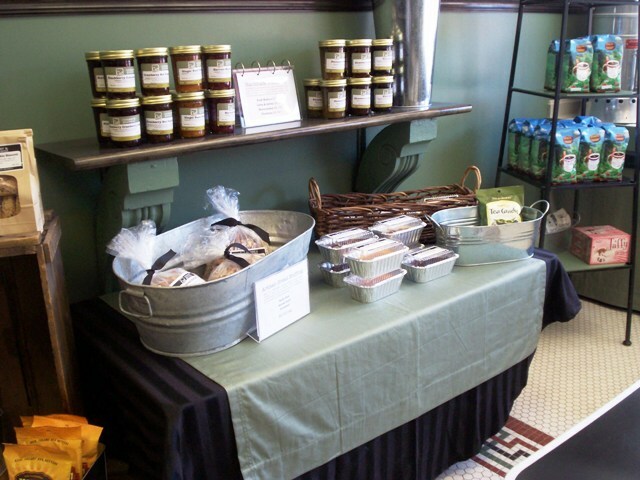 Gourmet & Gourmand is open from 10 a.m. to 6 p.m. Wednesday through Friday, 9 a.m. to 4 p.m. Saturday, and 9 a.m. to 2 p.m. Sunday. This is a cash only establishment. 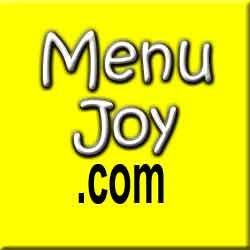 Don't forget our fabulous friends at MenuJoy.com for local restaurant menus.